Giveaway Winner and 2011 Recap! Cover image of "Irene Parenti Duclos: A Work Restored, an Artist Revealed"
Congratulations to Val S., the winner of the Florentine Press giveaway, Irene Parenti Duclos: A Work Restored, an Artist Revealed! Val, if you could email me your mailing address information (see my email address in the sidebar), I can pass it along to the Florentine Press. Congratulations! Mrs. Arnolfini Might Be Dead! I hope that in the upcoming year my humble little blog will offer an assortment of visual and scholarly pleasures, similar to Desiderio’s spread of paintings and books. Here’s to a great 2012! Happy art history-ing, too! Claus Sluter, detail of David and Jeremiah from the "Well of Moses," 1395-1406. Chartreuse de Champol, Dijon. Image courtesty simonsara via Wikipedia. I didn’t plan on spending my winter break rooting out an error in Stokstad’s Art History textbook. I promise! I just happened upon this error when looking for more information about the lost Calvary composition, which was originally part of Claus Sluter’s “Well of Moses” (1395-1406). 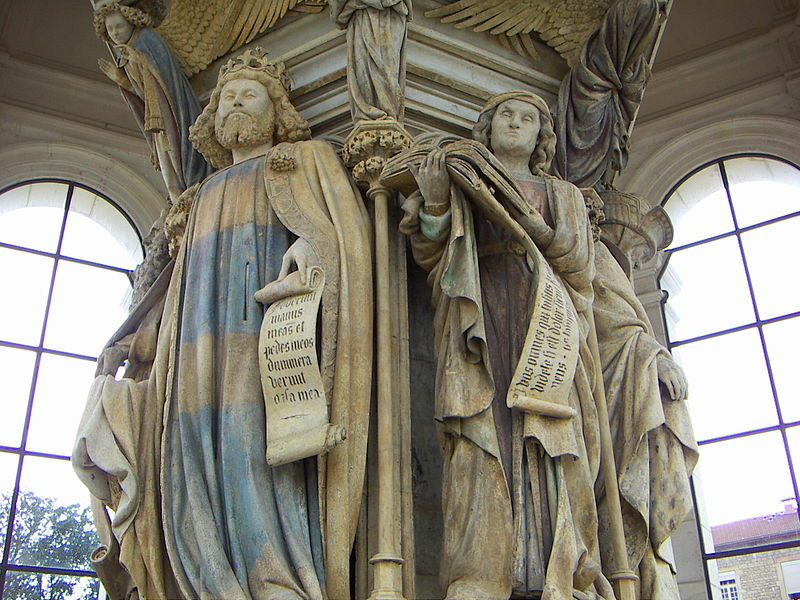 In truth, the “Well of Moses” originally served as a base for a large sculptural composition, which included a crucifix. Today’s “Well of Moses” is just a shadow of the original work produced by Sluter. On a side note, you may find it interesting that the “Well of Moses” is a relatively recent nickname for this work of art, having first been used in the late 18th century. Instead, early sources refer to this monument as “The Cross” or “The Great Cross.”1 From what I can gather, the original crucifix composition largely was destroyed in 1791, during the French Revolution. 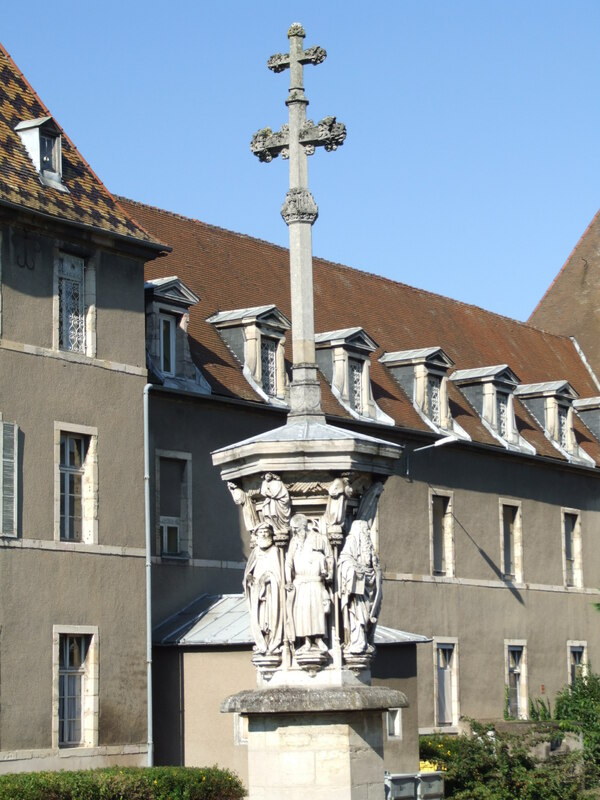 One can get a general sense of how the “Well of Moses” appeared by looking at a 16th century copy that is located at the Hôpital Général in Dijon, although there are no figures included with the Calvary scene (see below). I am disappointed that Stokstad’s Art History does not take recent research on the “Well of Moses” into account. A study published in 2005 reveals a very different (and unexpected) result of the crucifix composition. As part of a three-part series of articles on the “Well of Moses,” Susie Nash (of the Courtauld Institute) points out that the Calvary composition only depicted one figure at the base of the cross: Mary Magdalene.3 During the relatively recent restoration of the “Well of Moses” (a fifteen year project that ended in 2004), Nash was able to analyze the top of the “Well of Moses,” including the original mount for the crucifix. 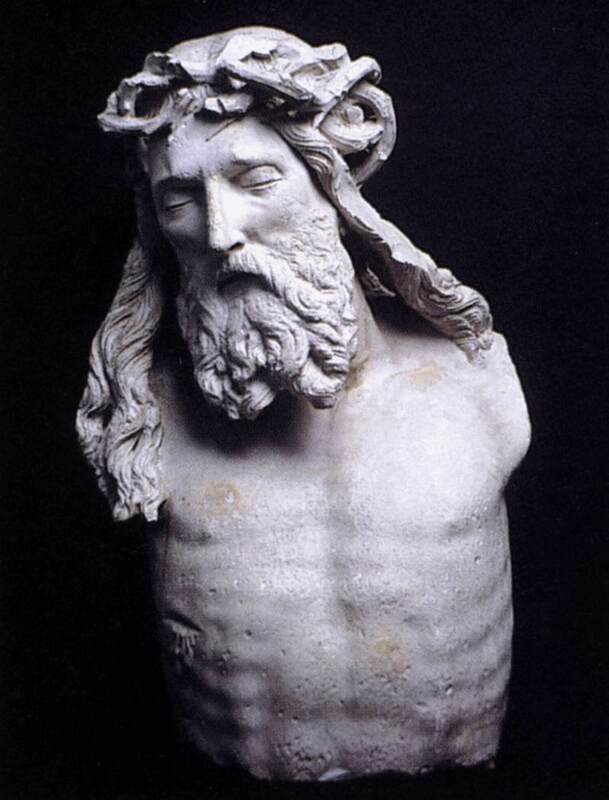 Nash also analyzed the remaining fragments from the Calvary composition, too, including the arms of Mary Magdalene. Nash concluded that the composition of the remaining base and extant fragments reveal that only one figure was located at the base of the cross. She also concluded, based on the fragments of the Mary Magdelene figure’s arms, that the Magdalene was originally embracing the foot of the cross. 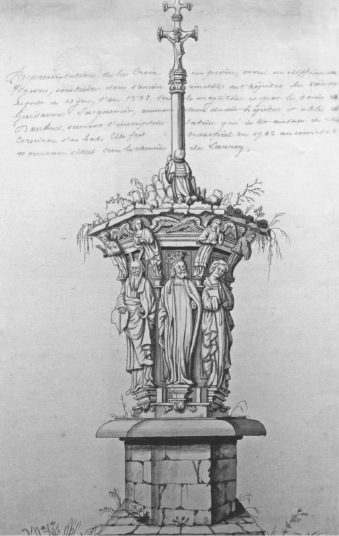 She supports her argument which archival evidence too, including an 18th century drawing of the Hôspital Général “Well of Moses” copy (see below). In some ways, perhaps I shouldn’t be too hard on Stokstad for mentioning three figures at the crucifix base instead of just one. Nash herself points out, “The belief that Sluter’s Calvary had three figures is so entrenched in the scholarly literature of the last 160 years that their existence has never been questioned.”4 But, as I have said before, I do feel like such a major art history textbook should be better at keeping up with current scholarship. Is Stokstad’s Art History so confidently “entrenched” that it doesn’t feel the need to include groundbreaking ideas? Omissions like Nash’s scholarship on Sluter reinforce to me that Stokstad’s book is not “the most…inclusive art history text on the market.” Although I think there are some great things about that textbook, I don’t think that Art History should be the art historian’s bible. P.S. Don’t forget that my giveaway on the Irene Duclos book ends tomorrow! Marilyn Stokstad and Michael Cothren, Art History, vol. 4 (Prentice Hall, 2011), p. 564. 3 Nash, 799, Susie Nash also has two other publications on the Well of Moses, which were published in The Burlington Magazine in July 2006, pp. 456-67 (Part II) and November 2008, pp. 724-741 (Part III). These two articles are also available on Nash’s faculty webpage. Keeping in line with the theme for this week on female artists (in connection with my ongoing GIVEAWAY! ), I wanted to write a Christmas post on female artists who painted Nativity scenes. This was a much more frustrating project than I anticipated; it was difficult to come up with examples to share. I suppose I shouldn’t be surprised that there aren’t too many (extant) examples out there, but I am a little disappointed. In some ways, it seems a little ironic that the most famous artistic scenes about birth were created by men! There are a few contemporary nativity scenes which I think are interesting. 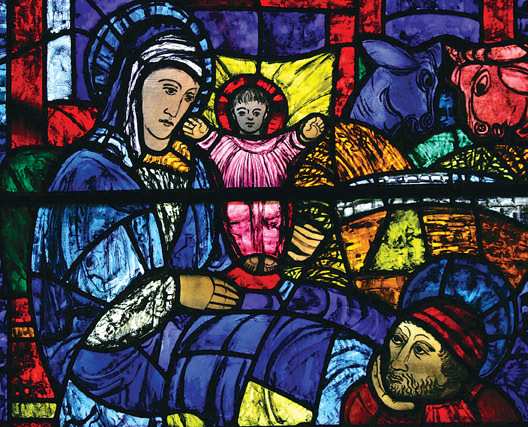 Janet McKenzie was commissioned to create The Nativity Project. I think her painting Mary and the Midwives (2003) is quite interesting, not only in terms of style but also subject matter and composition. 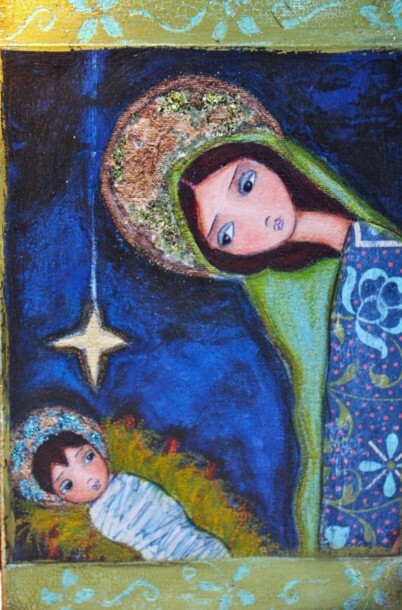 I also think Flor Larios’ Nativity Star (n.d.) is fun, as well as the Nativity scenes by Valerie Atkisson. It is disappointing that these works don’t exist anymore. However, don’t let this thought keep you from enjoying the Christmas holiday, friends! Do you know of any other nativity scenes (or “Adoration of the Shepherds” scenes) created by female artists? Please share! One of the only other examples (which is kinda-sorta similar to Christmas nativity scenes) is Artemisia Gentileschi’s Birth of Saint John the Baptist (c. 1635). 1 S. B. Kennedy, “Evie Hone,” in Dictionary of Women Artists, vol. 1 (Chicago: Fitzroy Dearborn Publishers, 1997), p. 402. Available online here. 2 Myriam Zerbi Fanna, “Lucrina Fetti” in Dictionary of Women Artists, vol. 1 (Chicago: Fitzroy Dearborn Publishers, 1997), p. 520-21. Available online here. 3 Ellen Creathorne Clayton, English Female Artists, vol. 2, p. 358. 4 Marylin Dunn, “Convents,” in Dictionary of Women Artists, vol. 1 (Chicago: Fitzroy Dearborn Publishers, 1997), p. 26. Available online here. See Franca Trinchieri Camiz, “Croce,” in Dictionary of Women Artists, vol. 1 (Chicago: Fitzroy Dearborn Publishers, 1997), p. 421. Available online here. Over the past few weeks I have had the pleasure to read a new book on a female painter, Irene Parenti Duclos. This book, Irene Parenti Duclos: A Work Restored, an Artist Revealed, was published by the Florentine Press in October 2011. I wasn’t familiar with Duclos before reading this book; she was well-respected female painter in 18th century from Florence. 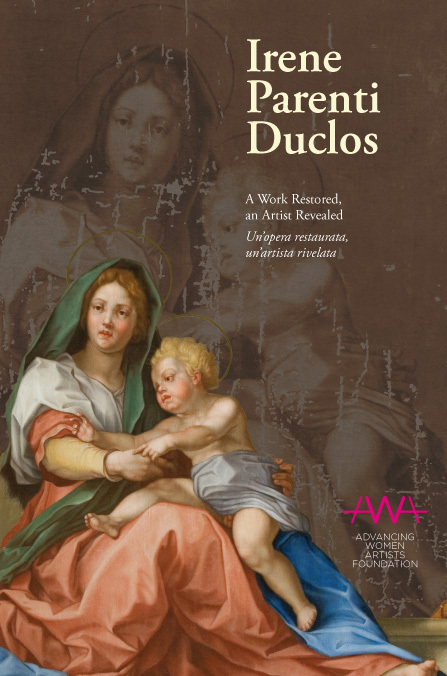 This book was written (in part) to discuss the restoration of Duclos’ copy of Andrea del Sarto’s Madonna del Sacco (18th century, detail of Duclos’ copy appears on book cover above). 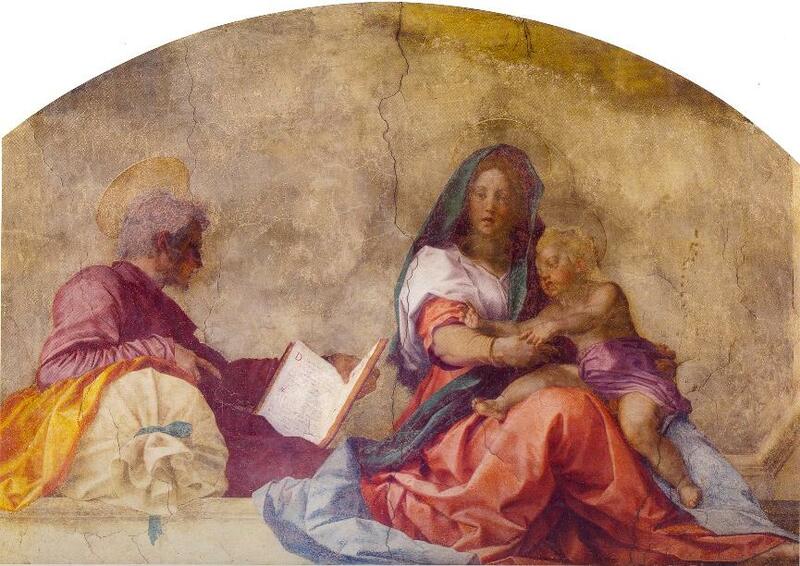 Coincidentally, the restoration of the Duclos canvas occurred at the same time that Andrea del Sarto’s original fresco (1525) underwent restoration (compare del Sarto’s pre-restoration fresco to the restored version). Scholars were able to collaborate and learn more about Duclos (and the del Sarto fresco) during this restorative period. You can read a little more about the Duclos copy and restoration here. This book is great for a lot of different reasons. For one thing, I like that this book was written and promoted with the help of the Advancing Women Artists Foundation. (What a great cause!) I also like the book has appeal to a lot of different types of people: art historians, feminists, connoisseurs, and restorers. The book pages are divided to accommodate text in two languages (English and Italian), and therefore appeals to an international audience. Book chapters are divided into different topics of interest. Some of the chapters are more technical than others (especially the last two chapters, which discuss the restoration of the canvas and the digital microscopy used in the process). Although these last two chapters were the most difficult for me to read (my art-historical brain isn’t used to scientific language! ), I still thought the discussion was interesting. As a feminist art historian, I was particularly interested the discussions on female artists. I liked reading a little bit more about Angelica Kauffman, Elizabeth Vigeé Le Brun, and other Italian female artists with whom I was not familiar before. Although Duclos was a painter in the 18th century, the discussion of female artists even expands to include the Renaissance artist, Suor Plautilla Nelli. 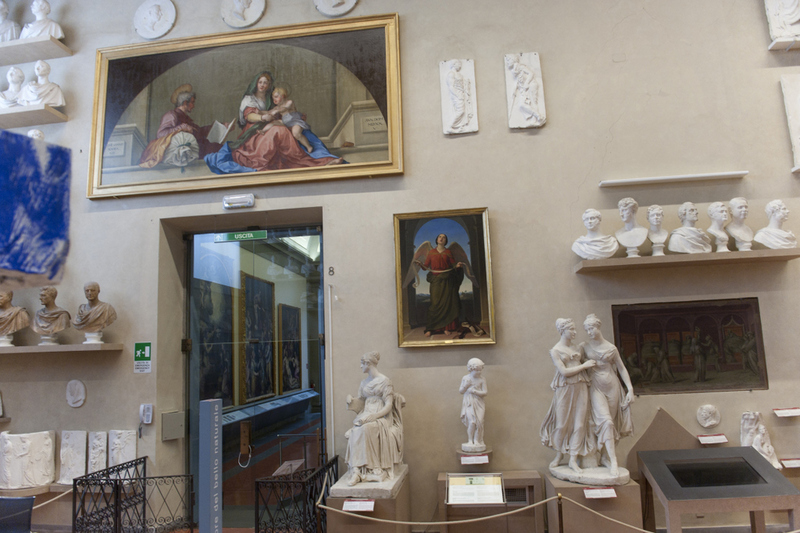 I was happy to see that Nelli was discussed in detail; I learned just a little about her when I read Vasari’s Lives of the Artists, but I’ve had difficulty learning more biographical information about her. I also appreciated that this book served as a call to action. Nelli’s large-scale painting from the 16th century, Last Supper (which is the only known version of this subject matter produced by a female artist) is in dire need of restoration. Hopefully this publication will bring more exposure to the works of female artists that need preservation and attention. I also enjoyed reading the chapter on the fondness for copying art during the 18th century. Today I think that artistic copies often are viewed with some disdain, implying that the copy is of lesser quality than the original work of art. In the 18th century, however, copies were seen in a much more favorable light. 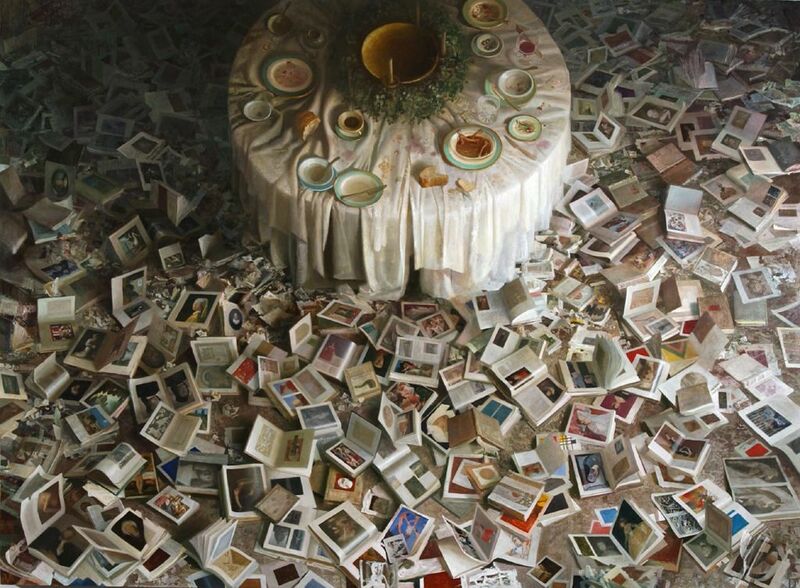 The collecting of copies was seen as a mark of respectability and prestige. 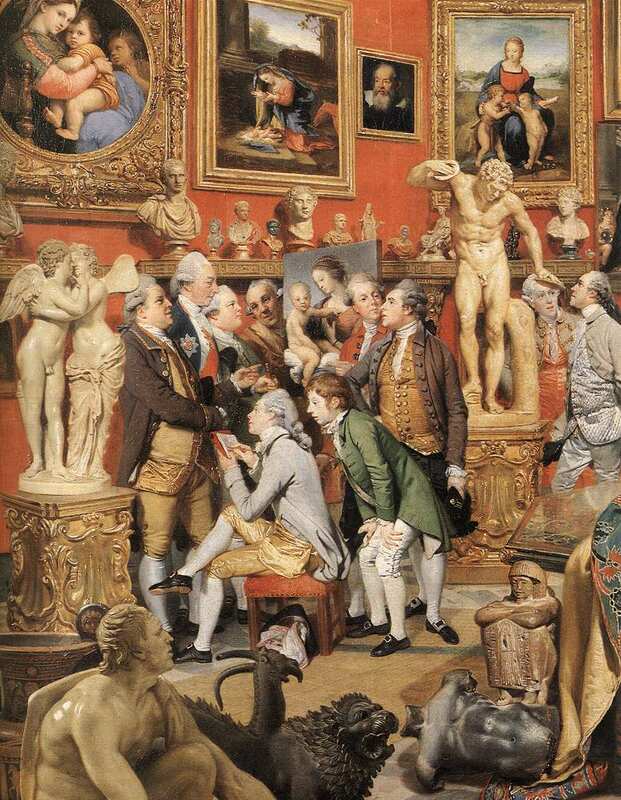 One of the paintings which typifies the 18th century rage for Italian works (and the copying of such paintings) is Zoffany’s The Tribuna of the Uffizi (1772-78). Not only did Zoffany copy many great works of art to produce his final canvas, but he also includes an artist in the process of copying a work of art (see above)! Along the lines of copying and prestige, though, I found it interesting that the book emphasized that 18th century female artists received acclaim as copyists and portrait artists.1 While I do think that this is true, I think it is also important to emphasize that women were still not considered capable of the highest level of achievement (i.e. history painting) as their male artistic counterparts. It seems to me that women only were acclaimed for the types of art which men found them capable of producing. A woman might be able to impressively copy or paint what she saw in front of her (as is the case with portraiture), but it seems apparent that women were also thought (by men) to lack the imagination and intellect necessary to create large-scale history paintings. 1) Leave a comment on this post! 2) Tweet about the giveaway (be sure to include my Twitter name: @albertis_window in your tweet, so I can find it). After tweeting, leave a comment on this post to let me know too, please. 3) Write about this giveaway on your own blog, and then include the URL in a comment on this post. 4) Become a fan of The Florentine on Facebook and enter your email address here (so we can cross-check it with your other entries) in the giveaway for a book by Linda Falcone – this way you have a chance to win yet another book! Please also leave a comment on this post, to let me know that you became a fan on Facebook. While you wait to find out if you won a free copy of the book, check out this nice video of the book presentation. 1 Linda Falcone, ed. “Irene Parenti Duclos: A Work Restored, an Artist Revealed,” (Florence: Florentine Press, 2011), 18, 27. Thanks to the Florentine Press for supplying the review copy of this book. Those who are interested in purchasing a copy of “Irene Parenti Duclos: An Work Restored an Artist Revealed” can find information here. Well, my friends, I did it. Last week my husband and I went down to Texas on an art pilgrimage. 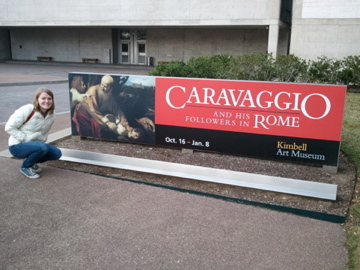 We first stopped in Houston to visit the Rothko Chapel (Rothko is my husband’s favorite artist), and then traveled up to Fort Worth so that I could visit the Caravaggio and His Followers in Rome exhibition at the Kimbell Art Museum. We hit a lot of great art museums and installations during the trip, but I loved the Caravaggio exhibit the most of all. It was a pretty phenomenal experience to see so many Caravaggesque paintings (and actual works by Caravaggio) in a single space. Monochromatic backgrounds, tenebristic lighting, and dirty fingernails reigned supreme. It was awesome. The exhibition display is pretty interesting. The exhibit is sectioned-off into areas that are dedicated to different types of subject matter (as is presented in the exhibition catalog). With the exception of a few paintings, most of the works by Caravaggio are not given too much visual prominence among the other works in the exhibition. 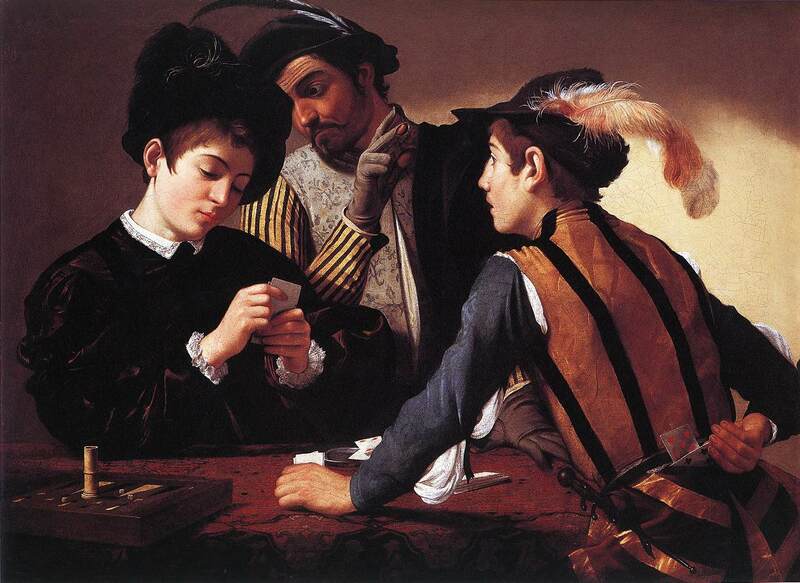 Instead, everything is combined together so that one can get a sense of the breadth and influence of Caravaggio’s style. I appreciated this comprehensive approach; I think that it was very easy for the exhibition to prove Caravaggio’s influence as a painter. However, I don’t think that it was easy for all museum visitors to tell which works were by Caravaggio without help from text labels and audio guides. I overheard one women telling someone that Caravaggio had painted a self-portrait in the background of one painting – and she was looking at a work by Simon Vouet! I would imagine that many typical visitors did not know the difference between Michelangelo Merisi da Caravaggio and his Caravaggesque follower, Cecco del Caravaggio. When I visited the museum on a busy weekend afternoon, the strongest visual indicator for Caravaggio’s paintings were the audio tour crowds that naturally formed. 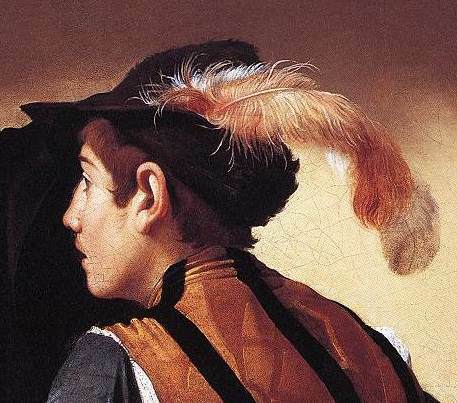 If a visitor didn’t know enough about Baroque art to pick out a work by Caravaggio, they simply needed to spot a crowd of people standing with their heads cocked, listening to an audio device. 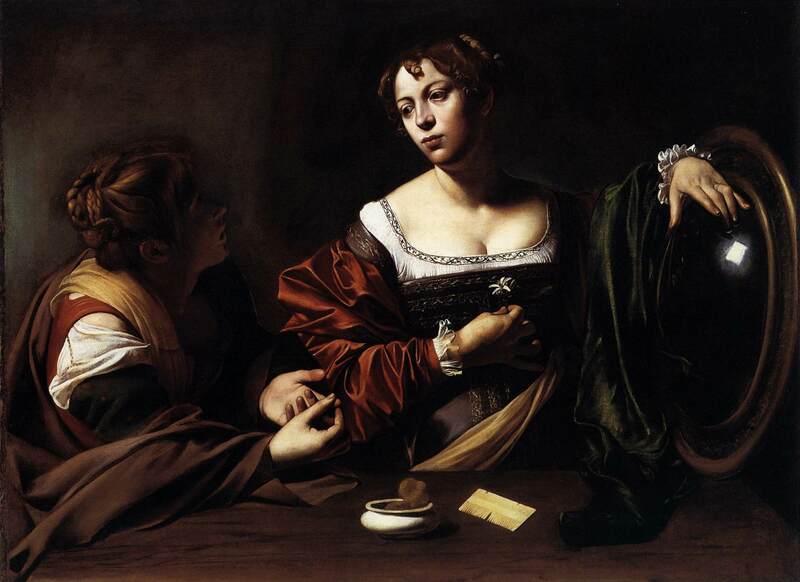 There were several details that I noticed during the exhibition about Caravaggio’s work. 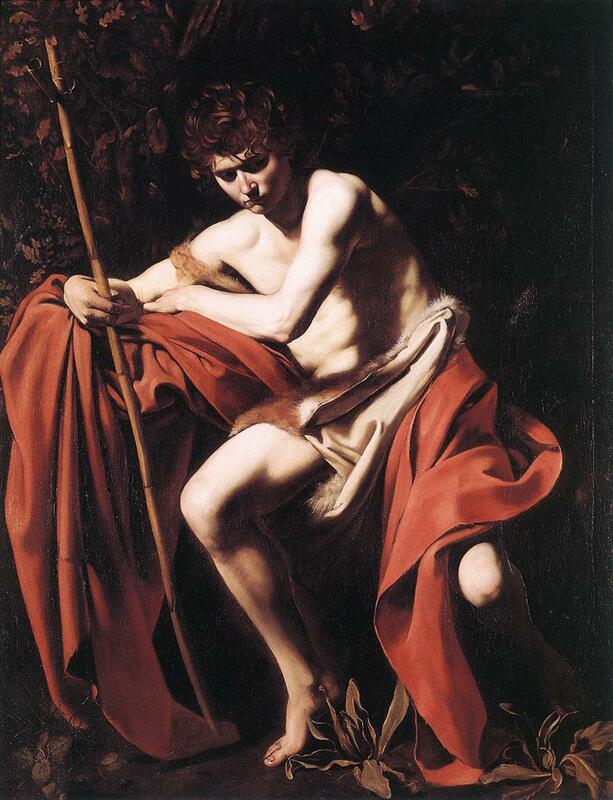 I was very struck with how Caravaggio’s tenebrism are even more striking when viewed in-person, especially in the painting Saint John the Baptist in the Wilderness (see above). The bright flesh of the saint seems to hum and glow with life, as does the brilliant vermillion drapery. Such vivacity is only offset with the exception of a few areas that are cloaked in dark swaths of shadow. The whole painting is indescribably impressive. One of the things that I loved about this exhibition was that I noticed several details in Caravaggio paintings that I had never noticed before. I remember noticing the slightest trace of a mustache on one of the figures in The Cardsharps (c. 1596, see detail above). I was impressed with the light, wispy quality of the feather stuck in the same figure’s hat. I also stopped for a long time to admire the texture of the shimmery, blue satin on Mary Magdalene’s dress in Martha and Mary Magdalene (c. 1598), something that is completely lost in some reproductions. Even the curl of Mary’s hair casts a dramatic and striking shadow, which doesn’t translate well in a reproduction. Several of the Caravaggesque paintings were striking as well (although not as striking as the works by Caravaggio, in my opinion). 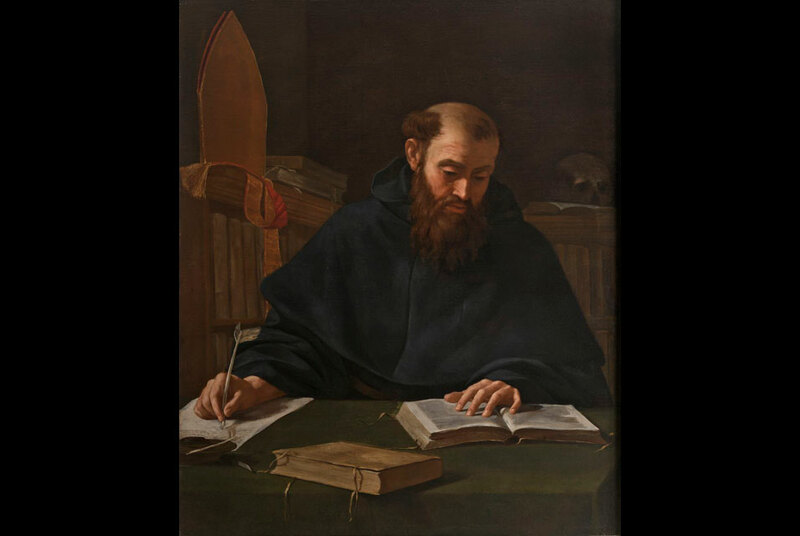 Ribera’s work impressed me the most. I particularly liked the leathery, tanned skin of Ribera’s Saint Jerome (c. 1623; Cat. 35). I remember looking at the fingers of that saint for some time. 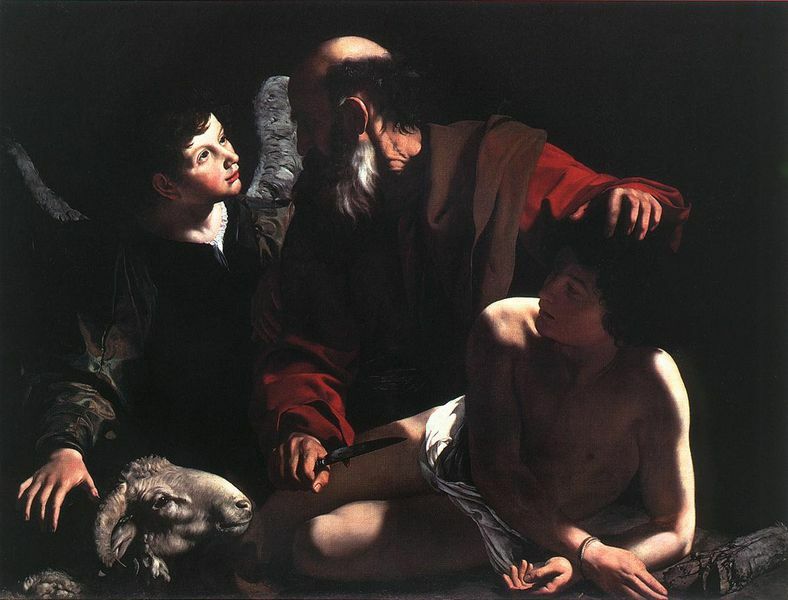 That being said, I didn’t think that all of the Caravaggesque paintings were very good. Some of them, in fact, looked simply ridiculous (to the point of being eyesores) when hung in the same room with Caravaggio’s Saint John the Baptist in the Wilderness. 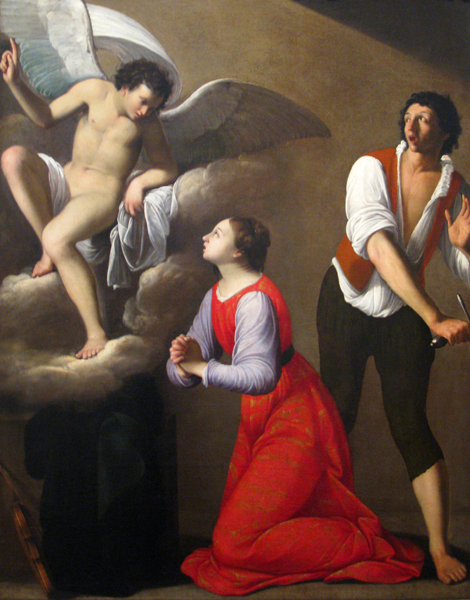 I wasn’t surprised to see that the museum placed The Holy Family in Saint Joseph’s Workshop (attributed to Carlo Saraceni or Guy François, c. 1615; cat. 41) and The Martyrdom of Saint Cecilia (Guy François, c. 1608-13; cat 12) behind two temporary walls. They looked like pretty poor paintings in comparison with Caravaggio’s work. When I complained about those paintings to my husband, he said, “When I saw those paintings, I got the impression Caravaggio influenced all kinds of painters, even ones that weren’t very good.” I’m not sure if the exhibition intended to convey that message, but that point was definitely made! I personally think the should have been taken out, though. These were some of the last two paintings that I saw during my visit, and it left a bad taste in my mouth (or a bad impression on my eyes, I should say). I had to turn and look at Saint John the Baptist in the Wilderness for a few more minutes afterward, just to cleanse by visual palette. All in all, I really enjoyed the show (despite seeing the paintings by Saraceni and François – ugh!). I would have liked to have seen a few more paintings that have been attributed to Caravaggio (some of which have had their authenticity and provenance called into question), but those paintings were only on view when the exhibition was in Canada earlier this year. Hopefully I’ll get to see Saint Augustine (c. 1600), Saint Francis (c. 1598, cat. 30) and Sacrifice of Isaac (c. 1598-99, shown above; cat. 53) another time, so that I can form my own opinion about those pieces. An email notification will be sent whenever a new post appears on this site. This blog focuses on making Western art history accessible and interesting to all types of audiences: art historians, students, and anyone else who is curious about art. Alberti’s Window is maintained by Monica Bowen, an art historian and professor. Header image: Caspar David Friedrich, Woman at a Window, 1822, modified.